I must admit when I first reported on this event I wasn’t 100% sure that it wasn’t an elaborate April Fool’s joke. The Russians celebrate the day in the same way as much of the rest of the world, with “trust no one!” the motto. However, the wealth of photo and video evidence that’s emerged since the event has removed all doubt. 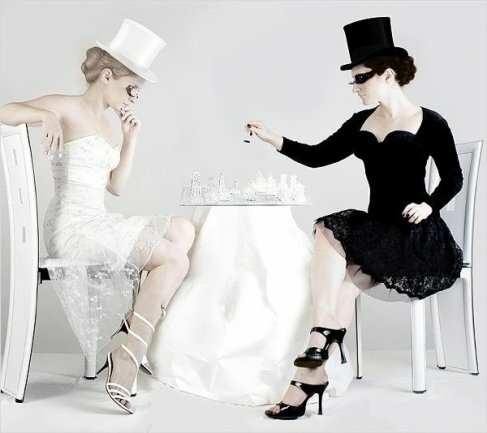 Eldar Mukhametov and Yana Melnikova for Chess Moscow. Eugene Potemkin was also prowling with video camera in hand, and you can find a staggering number of videos at his website, or YouTube Channel. The day started off badly for the blonde team when they faced a real struggle simply to find ten players (what does that say about the state of modern Russia?!). Desperate times call for desperate measures, and it was apparently only a quick visit to the hairdressers that boosted the number of blondes and allowed battle to commence! The tournament consisted of 10 rounds of 5-minute blitz games, with each woman playing every member of the opposing team. Three games each round were played on electronic boards and broadcast live on the internet. And here’s the video of the final stages and “post-mortem”! Although the spectators were perhaps outnumbered by photographers, there were at least two stars (actually, there was also Stanislav Govorukhin, a film director and politician, but Potemkin found him a more difficult interview subject, while Surov noted he answered a phone call during the very first round!). Eugene Potemkin’s interview with the camera-shy girls revealed (with some help from the adults around) that the girl in red, Masha, is the Moscow Under-8 Champion. Potemkin says near the end, “you’re the best 8-year-old” but, sensing a faux pas, turns to Sasha and adds, “you’re not yet the best, but tomorrow you’ll be the best!”. He notes on his website: “On the 1st April 2021 I’ll wake up famous as one of these girls will have become World Champion, and this will be her first interview”. But it was all to no avail. The final result was a brutal 60.5 – 39.5 victory for the brunettes, with the blonde team only managing to win a single round. The top-3 individuals were also brunettes, with Daria Charochkina winning her last game to reach 8.5/10 and catch Nazi Paikidze, who finished the event unbeaten. Still, there was something for all, and the blonde team didn’t seem too downhearted. Admittedly, it’s hard to find a photograph of Gunina without a smile on her face, but there were smiles all round in the final photographs. The above gives only a taste of the event, so if you want to see more of this unique chess occasion try clicking on the photo and video links at the start of this article! Great post Mishanp, I was dubious on the nature of this event myself until I saw the huge coverage, while I agree this year’s Chessbase’s April’s fool was… well I’m speechless.